A humble narrator has been on a bit of a “notice everything” kick of late, which I imagine would translate into “normal person” as “by Jove, one is surrounded by things which have always been accepted but unquestioned.” Well, I guess that’s how normal people think, I wouldn’t know. 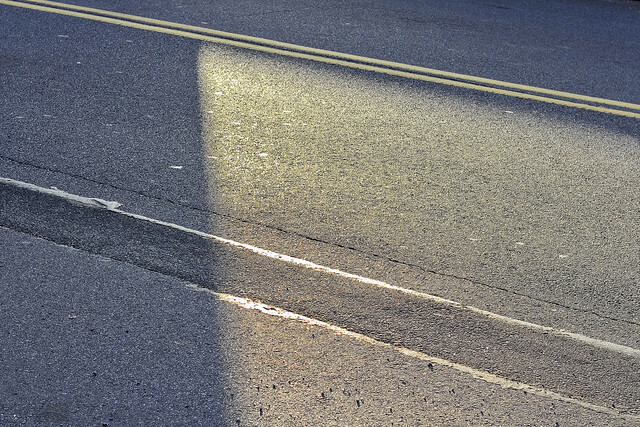 One of the things I’ve gotten curious about lately are streets, and more specifically – the roadway itself. This has led me down a bit of a merry path, which has led to the realization that just about every road in NYC, the United States, and in fact the world is paved with industrial waste. Elucidation follows, but first we need to discuss the development of the thoroughfare. Roads were originally created from the compaction of soil along trade routes in prehistoric times, and there were fairly common paths developed in Eurasia and Africa by around 10,000 BCE. The oldest stone paved road known to archaeology was built by the Egyptians, in roughly 2,300 BCE, although there are older “courdoroy” or log roads known (There’s a few in the UK which date back to around 4,000 BCE). Over on the Indian Subcontinent, streets were paved with brick as early as 3,000 BCE. Famously, the Romans were bloody brilliant at building roads, many of which have lasted into modern times. Their system involved the excavation of a fairly deep trench, followed by the laying and tamping down of several feet of differing grades of stone into it, with the top layer formed from a series of carefully cut paving stones which were quite heavy. The bottom layers allowed for drainage, the top layer armored the structure while using the force of gravity to keep it in place. For about a thousand years, the Roman system (similar technologies were used in China, and amongst the Inca in South America) was the best you could really hope for. The Europeans who colonized North America used crushed oyster shells and stones to form a road surface, and they mitigated the dust generated by horse and cart by using various forms of oil to hold the stuff in place. It wasn’t until the middle 18th century that roads became “modern” when a Frenchman named Pierre-Marie-Jérôme Trésaguet began working on carefully graded roads around Paris. Trésaguet was followed at the beginning of the 19th century by a Scot named Telford who created what modernity would refer to as “a cobblestone road” wherein the pavers were mortared in place using stone dust and gravel. Unfortunately, these methodologies used a tremendous amount of material, and required an enormous investment to lay the several feet of stone that was required for proper drainage and surface stability. Macadam roads wore tougher under carriage wheels, and were cheaper to build than “Telford’s”. Trial and error taught McAdam that a course of stones, broken up small enough and compacted by a heavy iron roller, would act as a solid mass if given proper drainage. It was perfect for horse and carriage, albeit a bit dusty. The roads of the industrial revolution era were generally paved in Macadam. 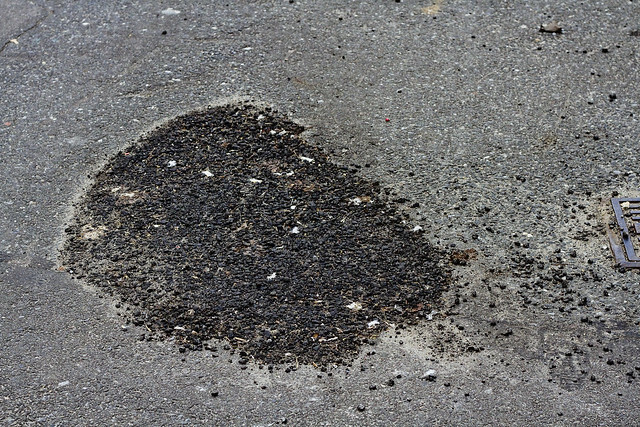 In 1902, a Swiss doctor named Ernest Guglielminetti hit upon the novel idea of using tar to coat the roads in Monaco. About twenty years later, an Englishman named Edgar Purnell Hooley patented a formula (in the UK and USA) which combined coal tar and blast furnace slag mixed into gravel and called his new product Tarmac, or Tarred Macadam. Tarmac became quite wide spread by the early days of the automobile, but by the late 1920’s the literal king of the road appeared and Tarmac went out of style. Also, even by the beginning of the 20th century, physician and politicians alike began to realize that Coal Tar was a particularly unhealthy thing to loose upon the environment. Luckily, nothing bad had ever come out of the nascent petroleum industry. Pitch was used for waterproofing the wooden joins on ships, inside buildings – anywhere you’d need a waterproof seal. It was also used as an incendiary for flaming arrows, and for boiling people you’d want to teach a lesson to. The British, and geologists, refer to naturally occurring Asphalt as “bitumen.” There’s natural lakes of the stuff to be found, notably in Trindidad/Tobago and it’s the tar you’ll find in the LaBrea Tar pits over on the left coast in Los Angeles. 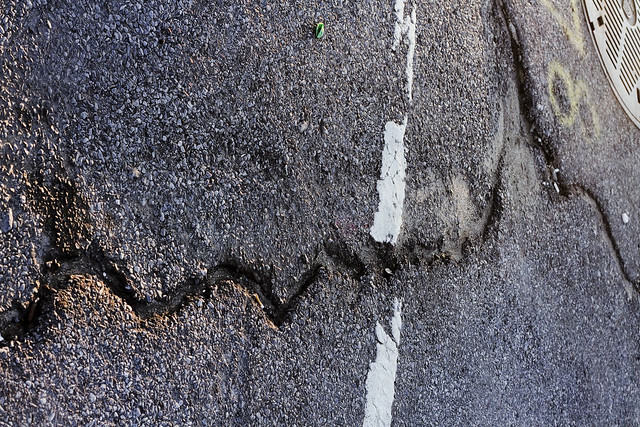 In New York City, modern day roads (with the exceptions of historic “Belgian Block” pavement, or the rare brick surface like Stockholm Street in Ridgewood) are paved with asphalted concrete. It’s a layer cake, according to the NYC DOT. There’s a base layer of gravel, which is covered by cement or concrete (which is sometimes reinforced with structural steel, depends of where it is and what the substrate is) which is armored by a top layer of asphalted concrete. Luckily, the roads in Queens are crappy, and on a recently replaced section of Northern Blvd. 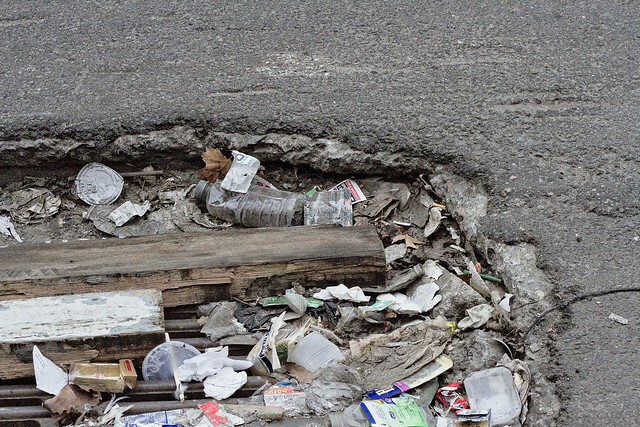 in Long Island City – you can see two of the layers surrounding a collapsing sewer drain. It’s actually quite a thin crust, when you get down to it. 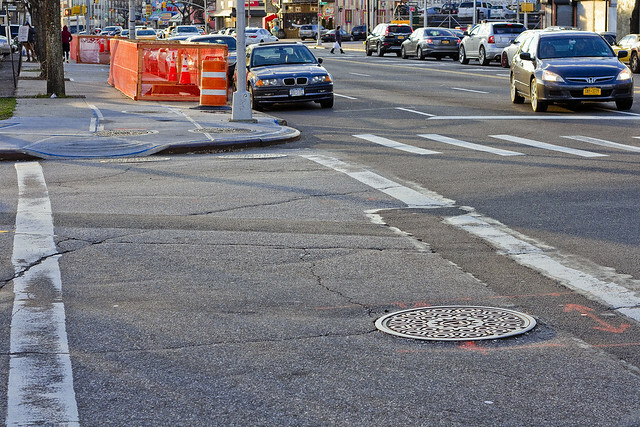 This PDF at NYC.gov offers the “Materials” chapter of the DOT’s street design manual, and it covers the various approved road surfaces (sidewalks too) which you are encouraged to use in the City of Greater New York. It will tell you that, amongst other things, asphalted concrete is the most highly recycled substance in our municipality. There is a “Green Asphalt” plant found in Blissville, at my beloved Newtown Creek, which is one of many facilities around the City which perform this sort of service. It seems that there is an economic, and practical, reason for placing these facilities within the City itself. Your “mix” needs to be within a certain distance of where you’re going to be laying it down, otherwise it begins to solidify and degrade in transit. 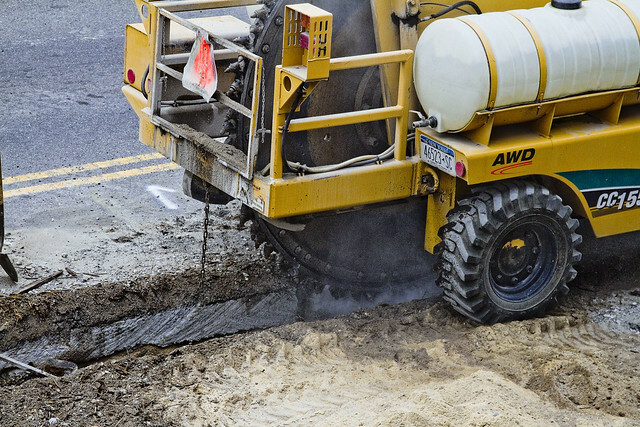 Closer to home – my home at least – on Broadway in Astoria, a “trencher” was observed cutting its way through the street. You can see the layer cake of concrete and asphalt, and in the post which originally described the device – this one – your humble narrator reported that several largish chunks of timber were being brought to the surface along with the concrete and asphalt. Broadway, in this section, is quite a complicated structure. The IND tracks of the R train are found at what’s probably 20-30 feet under the surface, which were constructing using the “cut and cover” method. There’s all kind of other stuff snaking around – sewers, utility tunnels, rat middens, etc. That means that the street is actually the uppermost section of a larger structure, meaning that if you fell down in the crosswalk – you’ve actually just landed on the roof of a building. As I mentioned above, how normal people think is a bit of a mystery to me. According to officialdom, 99% of Asphalt is recycled, and that 95% of the roads in the United States are paved with it. Asphalt pavement is rated according to the weather extremes it can withstand, and there are certain formulations designed for different climates. A different mix of tar and concrete is used for roads in Buffalo than those in NYC, for instance, due to climatological factors. Engineers I’ve checked in with like the stuff – describing it as “easy to work with, and easy to repair.” It seems that a fresh laid bed of asphalted concrete is structurally a single unit – until something goes wrong under the surface or utility access requirements and repairs forces laborers to start cutting holes in it. That’s when the surface starts to flow, and pull, and crack. 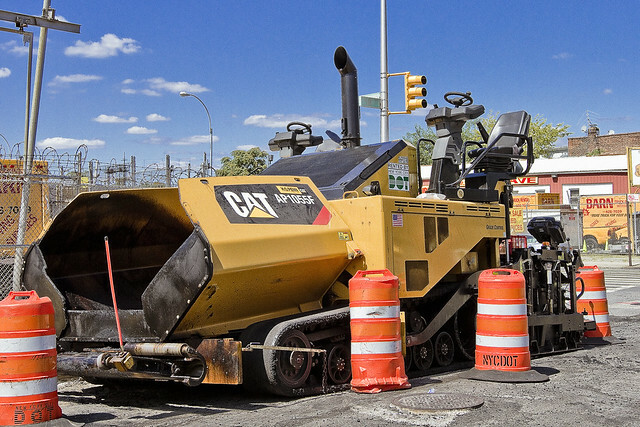 NYC is basically always working on one street or another – grinding, paving, laying new foundations. Given that a lot of the City sits on former wetlands, it’s a task best described as Sisyphean. So – back to the industrial waste part of things – according to a buddy who works as an Enviro-Cop, asphalt is actually a fairly benign substance as far as petroleum goes. Unlike other derivates, it’s environmentally stable once it has set. The recycling industry uses high levels of heat to release the bitumen from the concrete matrix, which allows it to be mixed in with a fresh batch of concrete and applied to a street. There’s all sorts of things which have, and still, get mixed into asphalted concrete. Although NYC claims its has never used the stuff on its roads, some have experimented with mixing in asbestos fibers, and or coal tar. Plastics collected by the recycling industry are often shredded and mixed in with the tar and concrete, as is glass. For a while, automotive tires were considered a good candidate for inclusion in the mix, but the cost of shredding steel belted rubber was too high. Routinely, fly ash from industrial furnaces is mixed in, along with all sorts of other stuff which would otherwise just fill up an ever shrinking square footage of municipal landfills and dumps. By the ton, the singularly largest part of the flow of NYC’s garbage involves the disposition of road construction waste. The fumes emitting from hot and freshly laid asphalt carry some risk, cancer wise, but the injuries most often associated with the material in its malleable form are laborers getting burned while working with it. Regardless, it’s another one of the many byproducts produced by the petroleum industry. 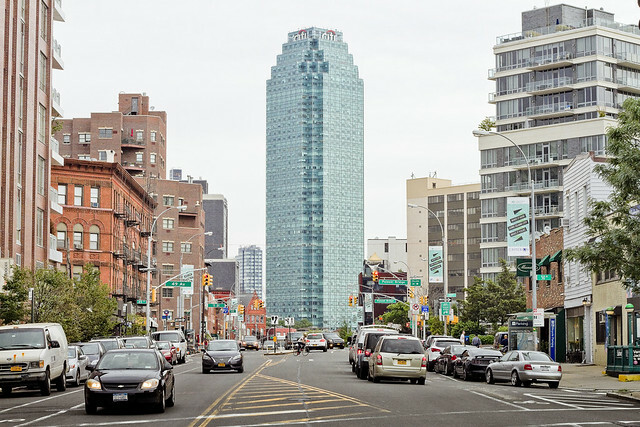 Remember, asphalt – which is found on nearly all of NYC’s 6,074 miles of roads and on 95% of the roads in the United States represents 1.7% of every barrel of crude oil sent to the refinery. About half of that barrel will become gasoline. According to the U.S. Energy Information: “In 2014, the United States consumed a total of 6.97 billion barrels of petroleum products, an average of about 19.11 million barrels per day. This total includes about 0.34 billion barrels of biofuels”. Of course this beggars the question, a paradox actually, which asks: if 99% of asphalt is recycled, where’s all the freshly manufactured stuff going? 1.7% of 6.97 billion barrels of oil would suggest that the U.S.A. produces 118,490,000 barrels of fresh Asphalt (or road oil) per year.